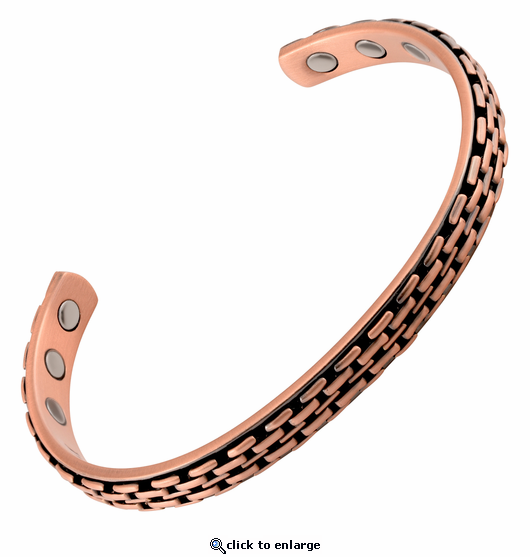 This is finely crafted solid copper magnetic therapy bracelet. Styled in antique copper weave, it has 6 powerful 3000 gauss neodymium rare earth bio north facing magnets. This copper magnetic bracelet is just a bit wider than 1/3" and has stainless steel magnet caps for added durability. Think you for a very good product!. I have RA, and your magnet jewelry helps me to cope with my joint pain. Seems to be helping with pain & discomfort. that was the purpose of my purchase. Looks good feels good. Turns my skin colors. Awsome buy. I was kinda skittish buyen them and waring them becouse im a guy but it helps my pain in my hands. Reply by MJS: We are glad it helps your pain. The color is normal for many people when wearing copper. It can easily wash off. Stainless steel will not do this. Started working in days and after about 3 weeks wrist pain is bearable. I am very satisfied with my order. I was very happy that the order arrived very quickly. The bracelet looks great and feels good; the service was excellent as well. I Haven't had it long enough to comment on the therapeutic value, but it is a great value no matter what. Bought two bracelets. High Quality, Competitively Priced and Shipped Quickly. Well pleased with purchase. Highly Recommend. Thanks!!!! best thing to help my tendonditis.I don't ever take it off!Had severe pain in right elbow now it's gone!Whether it's the magnets,copper ,the placebo effect or combonation of all I don't know.But I do know PAIN FREE! It shipped quickly and I was pleased with the size and workmanship. I have no hesitation recommending this to others. It works fine for me. Great product and the fastest shipping ever - thank you!!!!! Will definitely order again and recommend to friends! Both magnetic bracelets were purchased as Christmas gifts. The recipients loved them and put them on right away. Hope they are working like mine! Great Product!! Looks good and does wonders for pain relief. Highly recommended. The bracelet came as scheduled and I was delighted with what I saw. It is an attractive addition to my collection. I have worn it since reception and have worn it every day. KEEP IT UP. Very happy with the quality of this bracelet. Very sturdy and solid. Was much better than I expected. Very happy with this product. I am extremely pleased with all the bracelets I purchased from you. I have been buying magnetic bracelets from Walmart and the finish wears off very soon and the quality just isn't there. I love the items I got from you and will be a return customer--five stars plus! Both the bracelets I got are great and I rate them a 5. While the Looks is great and the price good, I have not seen any effect on the pain I have in my fingers. Your Magnetic Bracelet Helps Me To Walk! I am so happy to tell you that your magnetic bracelet has helped me to walk. I had a stroke and other serious health problems. Since the stroke, I was unable to walk straight. But since I have worn your bracelet, my balance has been so much better, I am able to walk straight. It is like a miracle for me. Fast Shipping, well made bracelet and enjoying. This company takes care of the customer. I have not had it long, but it is attractive and well priced. I surely hope it helps my arthritis But if it doesn't, it is still attractive. BOUGHT AS A GIFT. RECEIVER ABSOLUTELY LOVED IT. I am quite happy with the look and wear of the bracelet. A bit early to tell if it really helps, but will continue to wear the products as I bought several items and I am happy with all. It's OK, but haven't notice any appreciatable difference. Is the bracelet supposed to cover pain all over my body or just in may hand? Anyway, the jury is still out. Reply by MJS: It mayor may not help other areas of your body. Have you read the enclosed instructions? Are you wearing most of the time? Are the magnets resting against your skin? Have you experimented wearing on both wrists? Great bracelet, seems to be helping with tendonitis. Very attractive as well. Thank you for very nice bracelet. Very happy!